June 21, 2007, LG Crabo. 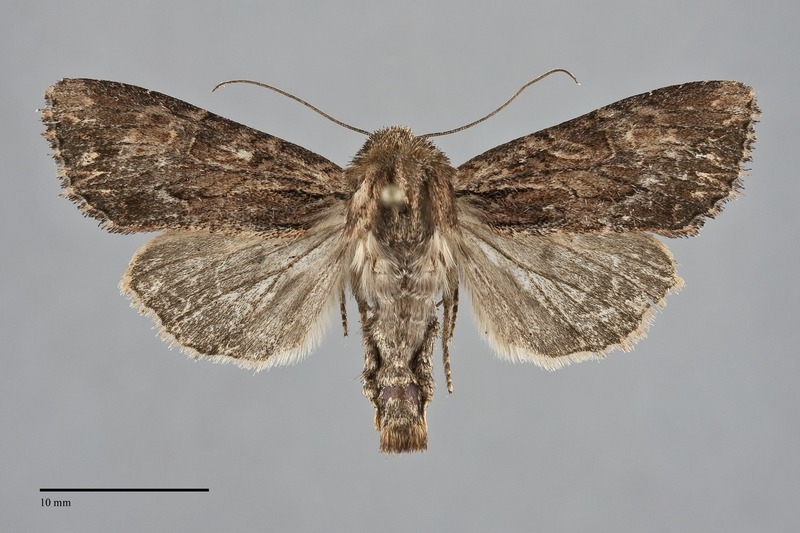 Apamea siskiyou is a medium-sized to large moth (FW length of 18–21 mm) that usually has a dark brown forewing with a large thin light tan W-mark on the distal wing that flies in west-coast prairies and open forests during early summer. The outer margin is usually slightly scalloped. The most common form has a slightly mottled dark brown or gray-brown forewing, slightly lighter yellow-brown distal to the reniform spot and at the apex. A thin black basal dash is present, and a similar black mark is present above the posterior margin near the base. A dark shade often extends across the median area in the fold. The terminal area is dark gray, broken into two patches by the subterminal area at the W-mark of the subterminal line. The basal, antemedial, and postmedial lines are darkbrown, double with filling of the ground color or lighter shade thereof. The lines are indistinct and partially absent except in the lightest individuals; however, a slanted black and light gray segment of the postmedial line in the fold is a prominent mark at the tip of the claviform spot. The tan subterminal line is incomplete, visible near the apex where it is offset, and prominently at the thin, even, and sharply-pointed W-mark on M3 and CuA1, forming a prominent mark in dark individuals. The dark-spotted terminal line is inconspicuous. The fringe is dark brown, often checkered with lighter brown. The orbicular and reniform spots are partially outlined in dark brown and light yellow-brown. The orbicular spot is elongate, oval or bar-like, filled centrally with a dark brown line. The reniform spot is hourglass-shaped, usually entirely filled with dark although only the lower part is dark in light specimens. The claviform spot is black to brown, usually reaching the postmedial line. A lighter form of this species occurs uncommonly with dark populations. It is light brown with more mottled pattern and more conspicuous lines and spots. The hindwing is medium-dark gray with darker gray veins, discal spot, and terminal line. The hindwing fringe is light tan. The head and thorax are brown with slightly darker brown near the edges of the collar and tegulae. The male antenna is beaded. This species can usually be identified by its large size, dark gray-brown color, and pale W-mark on the distal wing. 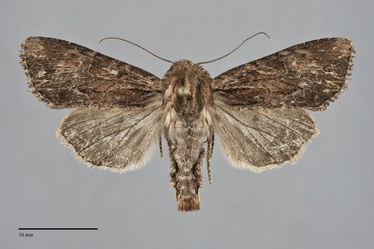 Lighter colored specimens can be confused with Apamea antennata, western specimens of which are darker and browner than those from other parts of its range. Apamea siskiyou tends to be slightly smaller that A. antennata, is usually much darker brown with dark filling of the reniform spot, has light yellow-brown around the dark filling of the reniform spot, a very well-defined pale W-mark at the mid-outer margin, and a darker hindwing lacking a reddish flush. The paler form of A. siskiyou can be difficult to distinguish from A. antennata without examining the genitalia. Males have different length claspers of the valves that can be observed by brushing away the scales. Those of A. siskiyou are longer, are thickened near the tip, and extend below the cucullus. The type locality of Apamea siskiyou Mikkola and Lafontaine is Eight Dollar Mtn. Road, [Josephine Co.], Oregon. This species is narrowly endemic to dry grasslands and oak savanna along the West Coast. In the Siskiyou region of southwestern Oregon, it has been found in both open, rocky serpentine grasslands and in open oak savanna. However, in the Willamette Valley of western Oregon, it appears to be completely restricted to virgin, native upland prairie with bunchgrasses. It occurs in open oak forests in the Columbia Gorge region. Apamea siskiyou occurs predominantly west of the Cascade Mountains. Despite its species epithet its range extends beyond southwestern Oregon through the Willamette Valley as far north as southern Washington near the Columbia River. The range extends east through the Columbia Gorge in southern Washington and Wasco County, Oregon. This species has a limited range on the West Coast of North America. The distribution outside of the Pacific Northwest is limited to north-western California and the northern Sierra Nevada. 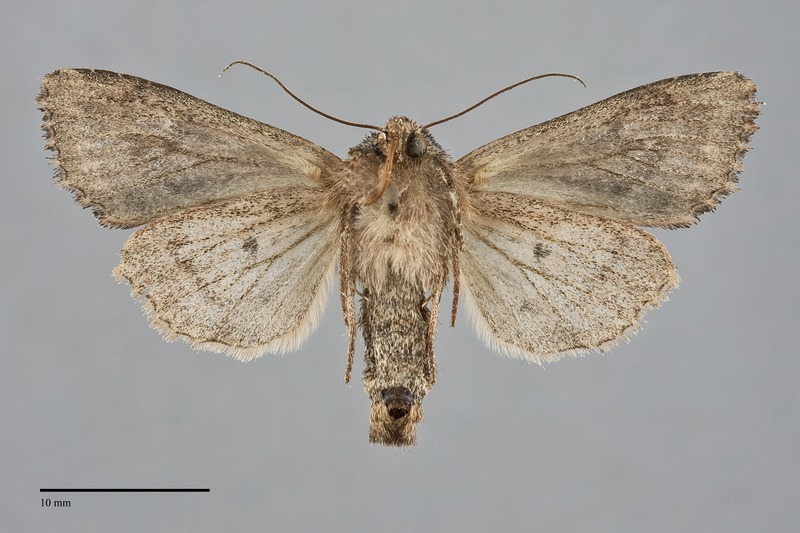 No information is presently available regarding the larval biology of this species, but it is probably a soil-surface feeding cutworm that feeds on native bunchgrasses in the Poaceae based upon the habitat. Adults fly from May to early July and have been collected most commonly during June in our area. They are nocturnal and come to lights..